Note: The navigation SD card must be in the SD card slot to operate the navigation system. If you need a replacement SD card, see your authorized dealer. Note: The SD card slot is spring-loaded. To remove the SD card, just push the card in and release it. Do not attempt to pull the card out to remove it; this could cause damage. Your navigation system is comprised of two main features, destination mode and map mode. To set a destination, press the green corner of your touchscreen, then Dest when it appears. See Setting a destination later in this chapter. To view the navigation map and your vehicle’s current location, touch the green bar in the upper right hand corner of the touchscreen, or, press Dest > Map. See Map mode later in this chapter. Press the green corner of your touchscreen, then Dest when it appears. 1. Enter the necessary information into the highlighted text fields (in any order). For address destination entry, Go! appears once you enter all the necessary information. Pressing Go! makes the address location appear on the map. If you choose Previous Destination, the last 20 destinations you have selected appear. 2. Select Set as Dest to make this your destination. You can also choose to set this as a waypoint (have the system route to this point on the way to your current destination) or save it as a favorite. The system considers any Avoid Areas selections in its route calculation. 3. Choose from up to three different types of routes, and then select Start Route. • Fastest Route: Uses the fastest moving roads possible. • Shortest Route: Uses the shortest distance possible. • Eco Route: Uses the most fuel-efficient route. You can cancel the route or have the system demo the route for you. Select Route Prefs to set route preferences like avoiding freeways, tollroads, ferries and car trains as well as to use or not use high-occupancy vehicle lanes. (High-occupancy vehicle lanes are also known as carpool or diamond lanes. People who ride in buses, vanpools or carpools use these lanes.) Note: If your vehicle is on a recognized road and you do not press the Start Route button, the system defaults to the Fastest Route option and begins guidance. During route guidance, you can press the talking bubble icon that appears in the upper right navigation corner (green bar) if you want the system to repeat route guidance information. When the system repeats the last guidance instruction, it updates the distance to the next guidance instruction, since it detects when the vehicle is moving. Your system offers a variety of points of interest categories. To expand these listings, press the + in front of the point of interest listing. When programming a point of interest destination, the system allows you to sort the resulting lists alphabetically, by distance or by cityseekr listings (if available). Pressing the Search Areas button allows you to search for points of interest nearby, near a city or state or near a destination, if a route is active. Pressing the Search By Name button allows you to directly enter the point of interest name into the system by using the keyboard. cityseekr point of interest information is limited to approximately 912 cities (881 in the United States, 20 in Canada and 11 in Mexico). cityseekr, when available, is a service that provides more information about certain points of interest such as restaurants, hotels and attractions. When you have selected a point of interest, the location and information appear, such as address and phone number. If cityseekr lists the point of interest, more information is available, such as a brief description, hotel check-in and checkout times or restaurant hours. Press More Information for a longer review, a list of services and facilities, the average room or meal price as well as the website link. selection exists in multiple categories within the system. When you are viewing more information for hotels, cityseekr also tells you if the hotel has certain services and facilities using icons. For restaurants, cityseekr can provide information, such as star rating, average cost, review, handicap access, hours of operation, and website address. For hotels, cityseekr can provide information, such as star rating, price category, review, check-in and check-out times, hotel service icons and website address. Select settings for the system to take into account when planning your route. displays your vehicle’s previously traveled route with white dots. Turn this feature ON or OFF. allows you to choose to have the system display your turn list Top to Bottom or Bottom to Top. sets the automatic parking points of interest notification. Turn this feature ON or OFF. When parking points of interest notification is on, the icons display on the map when you get close to your destination. This may not be very useful in dense areas, and may clutter the map when other points of interest display. Preferred Route allows you to choose to have the system display the Shortest, Fastest or most Ecological route first. If you set Always Use Preferred Route to Yes, the system uses the selected route type to calculate only one route to the desired destination. Always Use Preferred Route bypasses route selection in destination programming. The system only calculates one route based on the preferred route setting. Eco Time Penalty allows you to select a low, medium or high cost for the calculated Eco Route. The higher the setting, the longer the time allotment is for the route. Avoid features allows you to choose to have the system avoid freeways, toll roads, ferries and car trains when planning your route. Turn these features ON or OFF. Use HOV Lanes allows you to choose to have the system use high-occupancy vehicle lanes, if available, when planning your route. Guidance Prompts allows you to choose to have the system use Voice & Tones or Tone Only on your programmed route. Auto - Fill State/Province allows you have the system automatically fill in the state and province based on the information already entered into the system. Turn this feature ON or OFF. Avoid Traffic Problems allows you to choose how you want the system to handle traffic problems along your route. • Automatic: Have the system reroute you to avoid traffic incidents that develop and impact the current route. The system does not provide a traffic alert notification. • Manual: Have the system always provide a traffic alert notification for traffic incidents along the planned route. You have a choice to accept or ignore the notification before making the route deviation. Traffic Alert Notification allows you to choose have the system display traffic alert notifications. Other traffic alert features allows you to turn on certain, or all, traffic icons on the map such as road work, incident, accidents and closed roads. Scroll down to view all the different types of alerts. Turn these features ON or OFF. Avoid Areas allows you to choose areas which you want the system to avoid when calculating a route for you. Press Add to program an entry. Once you make a selection, the system tries to avoid the area(s) if possible for all routes. To delete a selection, choose the listing on the screen. When the screen changes to Avoid Areas Edit, you can press Delete at the bottom right of the screen. Press the green bar in the upper right area of the touchscreen to view map mode. Map mode shows advanced viewing comprised of both 2D city maps as well as 3D landmarks (when available). 2D city maps show detailed outlines of buildings, visible land use and land elements and detailed railway infrastructure for the most essential cities around the globe. These maps also contain features, such as town blocks, building footprints, and railways. 3D landmarks appear as clear, visible objects that are typically recognizable and have a certain tourist value. The 3D landmarks appear in 3D map mode only. Coverage varies, and improves with updated map releases. Change the appearance of the map display by repeatedly pressing the arrow button in the upper left corner of the screen. It toggles between three different map modes: Heading up, North up, and 3D. the direction of forward travel to be upward on the screen. This view is available for map scales up to 2.5 miles (4 kilometers). The system remembers this setting for larger map scales, but shows the map in North up only. If the scale returns below this level, the system restores Heading up. the northern direction to be upward on the screen. This viewing angle can be adjusted and the map can be rotated 180 degrees by touching the map twice, and then dragging your finger along the shaded bar with arrows at the bottom of the map. View switches between full map, street list and exit view in route guidance. Menu displays a pop-up box that allows direct access to navigation settings, View/Edit Route, Sirius Travel Link, Guidance Mute and Cancel Route. Re-center the map by pressing this icon whenever you scroll the map away from your vehicle’s current location. Press the green bar to access map mode, then select the + or - zoom button to bring up the zoom level and Auto buttons on the touchscreen. then synchronizes with vehicle speed. The slower your vehicle is traveling, the farther in the map zooms in; the faster your vehicle is traveling, the farther the map zooms out. To turn the feature off, just press the + or - button again. In 3D mode, rotate the map view by swiping your finger across the shaded bar with the arrows. It stays in the center of the map display, except when in scroll mode. scroll the map; the fixed icon is in the center of the screen. The map position closest to the cursor is in a window on the top center part of the screen. icon(s) indicates the location on the map of an address book entry. This is the default symbol shown after the entry has been stored to the Address Book by any method other than the map. You can select from any of the 22 icons available. You can use each icon more than once. the map currently stored as the home position. You can only save one address from the Address Book as your Home entry. You cannot change this icon. indicate locations of any point of interest categories you choose to display on the map. You can choose to display three point of interest categories on the map at one time. starting point of a planned route. of a waypoint on the map. The number inside the circle is different for each waypoint and represents the position of the waypoint in the route list. ending point of a planned route. location of the next turn on the planned route. insufficient GPS satellite signals are available for accurate map positioning. This icon may display under normal operation in an area with poor GPS access. When in map mode, touch anywhere on the map display to access more features. Touch this button to select a scrolled location on the map as your destination. You may scroll the map by pressing your index finger on the map display. When you reach the desired location, simply let go and then touch Set as Dest. Touch this button to set the current location as a waypoint. Touch this button to save the current location to your favorites. Touch this button to select icons to display on the map. You can select up to three icons to display on the map at the same time. Turn these ON or OFF. Touch this button to cancel the active route. Nokia is the digital map provider for the navigation application. If you find map data errors, you may report them directly to Nokia by going to http://mapreporter.navteq.com. Nokia evaluates all reported map errors and responds with the result of their investigation by e-mail. Annual navigation map updates are available for purchase through your dealership, by calling 1-800-NAVMAPS (in Mexico, call 01–800–557–5539) or going to www.navigation.com/ford. You need to specify the make and model of your vehicle to determine if there is an update available. 1. This command is only available when a navigation route is active. 2. 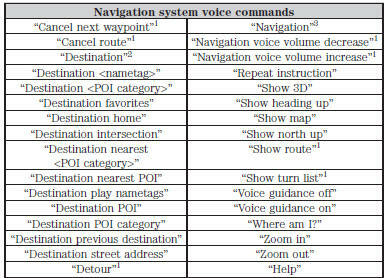 If you have said the command, “Destination”, you may say any of the above commands or commands in the following Destination chart. 3. If you have said the command, “Navigation”, you may say any of the above commands or commands in the following Navigation chart. 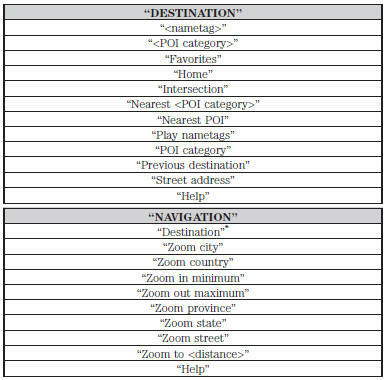 *If you have said, “Destination”, you may say any of the commands in the Destination chart. When you say either “Navigation destination street address” or “Destination street address”, the system asks you to say the full address. The system displays an example on-screen. You can then speak the address naturally, such as “One two three four Main Street, Anytown”.